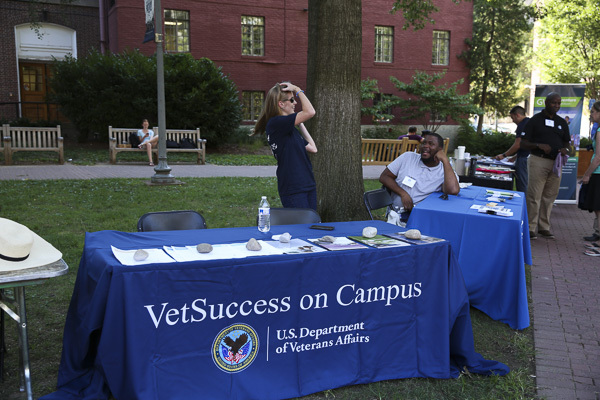 VetSuccess tabled at a Welcome Week event for veterans last month. Laura Ferraro, the new VetSuccess campus counselor, joined the Office of Military and Veteran Student Services over the summer. A new counselor on campus will help student veterans as they navigate their ways through college. Laura Ferraro, the new VetSuccess on Campus counselor, joined the Office of Military and Veteran Student Services over the summer. As a representative for a Department of Veterans Affairs program, she will help student veterans and qualified dependents reach their academic goals and counsel them throughout their time at GW. Victoria Pridemore, the associate director of military and veteran student services, said having a designated counselor on campus will alleviate student veterans’ stress when making medical appointments or applying for benefits. “The academic and career outreach gives GW student veterans a leg up in transitioning to the civilian community,” Pridemore said in an email. Ferraro hopes to focus on helping student veterans succeed academically by pairing them with tutors and presenting them with academic resources, Pridemore said. In her position, Ferraro will aid students in job searches by providing career counseling and aptitude tests. Ferraro comes to GW from four years as a vocational rehabilitation counselor for the U.S. Department of Veterans Affairs. She also spent time working with wounded and ill soldiers at the Walter Reed National Military Medical Center, according to her profile on the military office website. GW joined the VetSuccess program in summer 2013. Roger Deason previously held the role until he retired from the Department of Veterans Affairs last spring. Yannick Baptiste, the president of GW Veterans, said there was a delay in replacing Deason at GW because the VA prioritizes replacing counselors at their headquarters before filling empty slots at universities. Having Ferraro on campus will benefit more than 1,700 student veterans at the University because she reports directly to the Department of Veterans Affairs, allowing her to provide some services beyond GW’s scope, Baptiste said. Baptiste said Ferraro can also provide students with referrals for specialized health care, including mental health care, from external providers and the Department of Veterans Affairs. Lisa Fells, a VetSuccess counselor at the University of Alabama, said having a vocational and career outreach counselor is an “awesome experience” for student veterans. Fells said that students under financial and academic strains can benefit from having a counselor on their campuses.